Aaah, Summers!! blazing red hot sun over your head, elevating mercury, hot humid air, sweating, itching, thirst, sun burns, fainting, and dehydration, these are the common words with which we welcome the summers. In summers, when the temperature rises our body tries to sweat more to maintain an equilibrium between the inside and outside temperature difference. Higher the temperature more will be the sweating to regulate the temperature of our body and more will be the loss of water from the body. 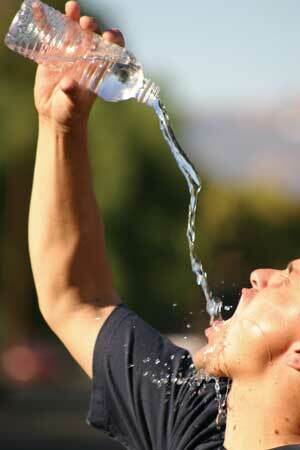 Dehydration is the most common problem of hot summers. It is the condition when body loses more water than it holds. The human body is about 60-70 % water depending on its size. In normal metabolic processes, sweating and urinating, there is loss of water, and this gets fasten with the onset of summers. It may occur due to many etiologies, like sun heat, diarrhea, vomiting, or due to any long term illness. Replenishment of this loss is very necessary for a healthy living. Here I am compiling few tips which may help you hydrating this summer. Drink lots and lots of water. It will keep your body hydrated. We should drink at least 8-10 glass of water a day to battle the heat and replenish the water lost through excessive sweating. Eat fruits. Seasonal fruits such as watermelon and cucumber are the best way to avoid being dehydrated this season. These have high water and fiber content and are the best options as summer snacks and when we don’t prefer the tasteless water. Plus these fruits will keep you hydrated and healthy in summers. Add water content in your food. Salad, sprouts along with vegetables such as spinach, tomato, lauki (bottleground) similarly dairy products such as milk, curd and paneer can provide us with enough water to avoid the loss. Other sources of water. Coconut water, lassi, buttermilk (chaach), sugarcane juice and juices of seasonal fruits will be great options to regain the minerals and fluids lost. Avoid heavy, spicy and fried food items. Pickle, fried chips, namkeen and papad should be avoided. Work hard, but indoor workout will be better. Exercise is a must to keep you fit and healthy. But with the increasing temperature, you need to work out with caution, because your hard work will make you sweat, more calorie burn and more water loss. Taking breaks in between and sipping more water will keep you well hydrated. Clothing plays an important role in preventing perspiration. Don’t opt dark colored, tight fitted dresses; instead go for light flourishing colors, cotton fabric, loose fitted with half sleeves. This will give your skin a chance to breathe. Avoid alcohol. Alcohol or other items which contain alcohol acts as a diuretic, that is, they increase the frequency of urination. Cover yourself with scarf and umbrella while roaming around. This will prevent your skin tanning, hair drying and sunstroke. In a case of vomiting, diarrhea, immediately consult your doctor. These are few steps to beat the unbearable heat and the accompanying dehydration in this season. So don’t keep yourself away from the fun. Grab the hats, water bottles, guard yourself safely and face the challenge of harsh hot rays of sun.